I can’t tell you how many times, over the years, I’ve received calls asking for a mismatched iron bed footboard or headboard. And how many times the person asking was wanting to use an iron bed for a gate. Well in all the years of hearing this I’ve never actually seen one used until today. One of the reasons you don’t see iron beds being used as gates is simply because the value of the bed is far greater as a “bed”, than if it were to be used as a gate. But there will always be people excentric enough to use one as a gate. I guess if it comes down to it, and you live in a rural area where it’s best to use whats available…….why not. Actually……… what better way to be “green” in this day and age, than to recycle an old iron bed for whatever use you could find for it. Especially if it’s an attractive piece that lifts the spirit when you see it. 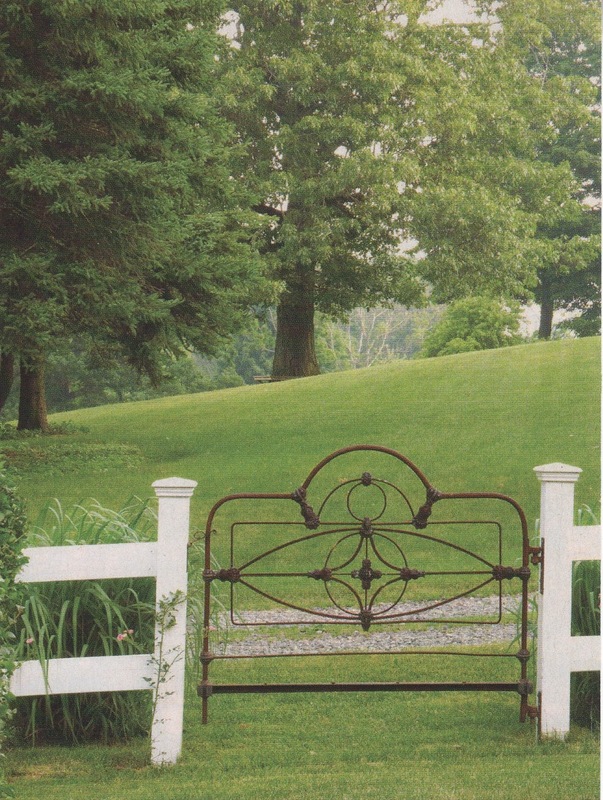 I’m sure you’ll agree…….whoever decided to use this old iron bed footboard for the purpose of a gate, did a very nice job. Although I’d never advocate the use of iron beds as gates……..unless one of the ends had been lost or damaged beyond repair, I do admire the resourcefulness of whoever used the one in this photo.